This beautifully furnished, clean & comfortable townhouse. Complex is directly on the Gulf of Mexico. We have undated with new kitchen with granite counter tops all new appliances. New bathrooms, new carpet, and beautifully redone all three private decks. We are just one unit back from gulf front. The sunsets are breathtaking from the 35 foot private deck overlooking the ocean. This is a quiet area, no crowds, with pristine white beaches and beautiful emerald waters of the Gulf. 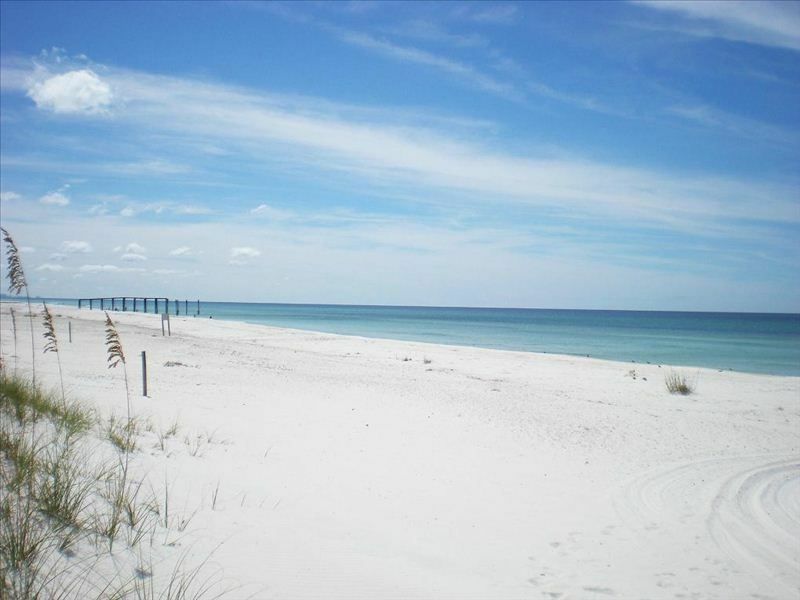 There is a new walkover that takes you only 2 - 3 minutes to walk to the most beautiful, secluded area of The Beaches of South Walton. Our beaches are never crowded, as there are no high rises or hotels in the area. Our complex is next to Camp Helen State Park, so there is at least a half mile of nothing but gorgeous dunes and wide beaches! This location is truly the best of both worlds! A peaceful, serene setting, yet everything you could need or want is just a short drive away. You'll find some of the best restaurants in the state, plenty of shopping, along with lots of entertainment for the kids. The awesome 'open air lifestyle center', Pier Park is only 10 minutes away. Enjoy the beautiful 'beachy' architecture while shopping...There's Dillard's, Target, J.C. Penny, Marshalls & Chico's to name just a few! A long list of great restaurants includes Buffett's Margaritaville, the Back Porch, Long Horns, Five Guy's Burgers, Guglionie's Italian, Olive Garden, Ihop and many more! Enjoy a movie at the state of the art Grand 16 Movie Theater...Everyone will love Pier Park! We also have 3 great great restaurants, Publix, Winn Dixie and CVS Drug Store within two miles of us. So if you want to cook in and enjoy more of the beach, our new kitchen has everything you will need for great at home entertaining and you can carry your meals out to the deck or cook on the grill. It's all there for you to decide how to spend your wonderful vacation. Just bring your clothes, bathing suit, food and sunscreen! If you want to relax and enjoy the beauty of nature & sounds of the sea, this is the place for you! We bought this townhouse after spending many years vacationing in Inlet Beach with our family. We have now owned our vacation spot for over 20 years and love the area more than ever. Because of its location near the Camp Helen nautre preserve our beaches are never crowded. And the wide white sandy beaches give you a large beach for any activities you and family enjoy. This is truly one of the last beaches in our area that is like nature intended. Yet we are still close to all the activities that you and your family can enjoy during your stay. We feel we have the perfect location for anything that we would like to do while at the beach. To the west and east of us, there are great golf courses, restaurants, shopping and tons of things for kids to do. And we are right in the middle on the worlds most beautiful beach. Each bedroom has a private bath. Half bath is off the living room. All linens. Guest required to bring their own beach towels. No linens allowed outside of townhouse. Completely furnished with microwave, toaster oven, blender, toaster, coffee maker and hand mixer. Large 35 foot deck with beautiful views of the sunset with a Pergola at one end for dining in the shade. Great vacation spot for families. Perfect place for “Winter Guest” Get-way-spot for couples. This place is wonderful. It has a big beautiful deck and is literally one building away from the beach. Because of the neighboring state park it was like having the beach to ourselves over spring break, a mere few miles from the business of Panama City Beach. Would love to return! We had a very nice time at the condo. The up dates that have been done are nice and the porch is great! Beautiful and quiet area right beside Camp Helen State Park and Lake Powell! We really enjoyed our stay in Inlet Beach! The beach was absolutely beautiful and definitely not crowded (most days there was no one within 1/4 to 1/2 mile of us) although it was a little farther distance down to the actual beach that what we had thought - our best time was a 5 minute walk (up and down several sets of stairs on the boardwalk, parts of which is pictured in the photos). This is a 2 level unit with parking underneath the unit. The beds were comfortable and the views from the decks were amazing. The owners were very responsive to any concerns we had. Lots of restaurants nearby and in PCB. Beautiful Camp Helen State Park is just east of this property. The property was clean and well kept. We had everything we needed. We had a great vacation and hope to make it back next year! We have been coming to the Inlet Beach area for over 20 years. You just can't beat the sand and water! This was our first time staying at this property. Even though it's not directly on the beach, it's plenty close enough, and the walk wasn't bad at all. The owner Janice was very friendly and awesome to work with as well. This is an amazing property on a quiet, clean beach. The town home is very well kept and has everything you would need for a family vacation. Two comfortable bedrooms, each with their own bathroom, a spacious living area, and a well-stocked kitchen. The picture really does not lie-we were there during spring break and there was not another person near us on the beach. If you want crowds go to Key West. If you want relaxation go to Inlet Beach. The hosts were helpful and communicated promptly. Great place, and I hope to go back soon! I require a call before any monthly rental is paid or reserved. I would prefer a call before any reservation is paid. Rates are subject to change until confirmed. Winter monthly rates are for 2 people only and require a $500.00 security deposit. Additional fees may apply for overnight guest. A Reservation Fee will be added for monthly guest that prefer to pay by credit card. No charge for eCheck or Cashiers Check. Security deposit for monthly rentals is $500.00.